I Buy Way Too Many Records Dot Com: Basement Benders - Native Tongues 7"
Though I do get some records sent to me to review, I can't say I'm on many record labels proper review lists. That's not a complaint, fish don't come much smaller than me and the cost of sending out a record probably makes it an unsound business practice. What I love though, is when I place an order for some records from one of these great labels and they toss in some extra stuff I didn't order to review. 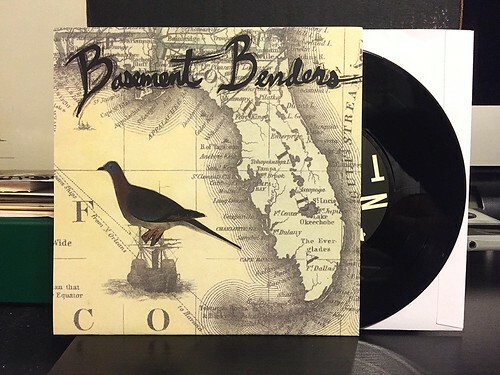 Basement Benders is one of these records that came packed in with an order from Drunken Sailor. While I can't say that I really love this, it's still pretty good and I can see other people liking it more than I do. The band is playing scrappy punk with ragged guitars that hang out on the treble side of the sound spectrum. The A side contains the catchier of the songs and I tend to favor those, "Native Tongues" being the real standout. On the B side, "Train Song" keeps the momentum moving along, but things slow down a little bit with "Voices." I'm not as instantly drawn to those two as they are not as obviously catchy as the songs on the flip, but again, they're totally fine. I think what really holds this back for me is the vocals. It sounds like they have several singers, but none of them really stick with me. I'm am notoriously fussy about vocals and the slightest thing can give me pause at times. Still, it's a decent little 7" and I think there are a lot of people out there that will probably dig it even more than me.